Welcome to L-W-O's Healthy Living page. 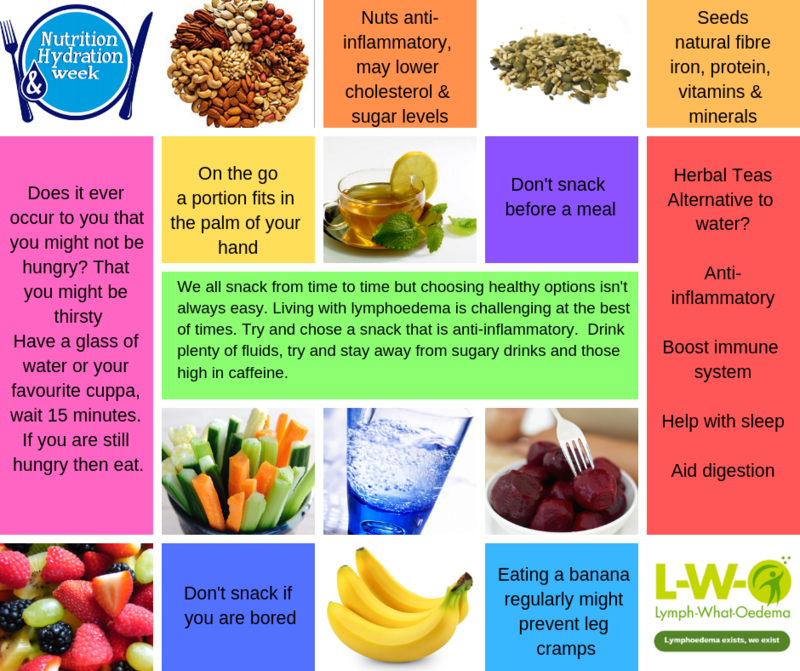 The aim of this page is about the lifestyle changes for those of us who live with Lymphoedema often must make, it is so important to eat a healthy balanced diet and drink water. Nobody likes being told that they can't or shouldn't do something. 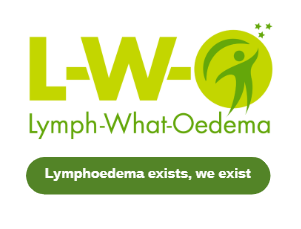 Living with the lifelong condition of lymphoedema, even though, this condition is manageable, means that, we need to look after ourselves. 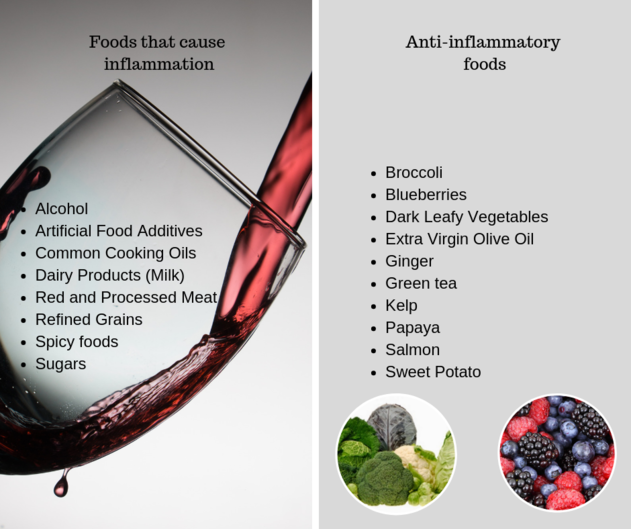 Certain foods, such as spicy and salty food, or alcohol (especially wine) can cause an increase in swelling. Alcohol turns to sugar, sugar becomes bacteria. 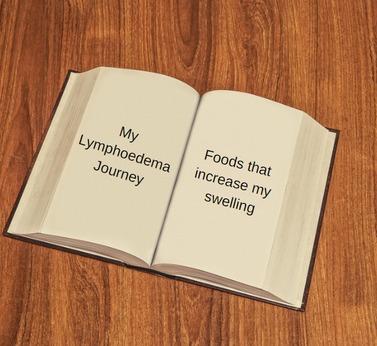 It is important to eat healthily which will improve our general health and well-being whilst coping with our lymphoedema. No dietary protein restriction is recommended for lymphoedema even though lymph is a protein-rich fluid. Controlling weight will also help but especially for those who have this condition in their legs. Lots of us eat too much but we can't always be on a roller coaster of dieting. Our closed support group members have discussed just about every diet going from the 5.2 diet, Low Carb, Atkins, Paleo, Slimming World, Weight Watchers, Rosemary Conley, Sugar Free, The Rad diet and now the Keto diet is the one everyone is talking about. Why is weight control important? Weight control is essential because it has been suggested that the extra fatty tissue affects the lymphatic channels, reducing the flow of fluid through them. Keep a record if you are feeling unwell and note which foods or drinks you think makes your lymphoedema worse so that you can avoid them. Each of us know our bodies better than anyone else, so when we get out of sync then, we need to look for the cause. We might have over indulged, burnt the candle at both ends or simply eaten or drunk an item which doesn't suit our lymphoedema. This happens to all of us. This type of diet is not a quick fix. 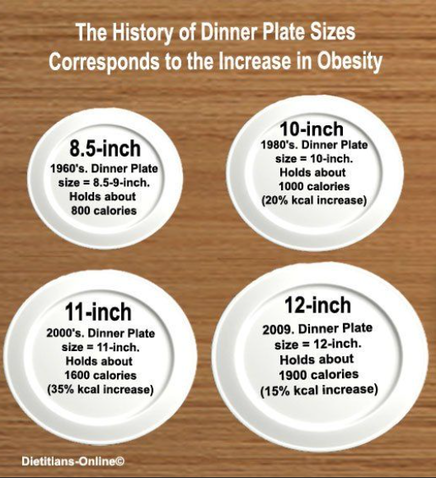 Using a smaller plate get the stomach use to smaller portions without counting calories or weighing food. Think of it, as being a lifestyle change rather than a diet. In many European countries it is recommended you eat seven portions of fruit and vegetables a day. <span style=">In this day and age where incomes are limited and organic food is often more expensive, my tip would be to have a small scrubbing brush in the kitchen so that you can buy whatever fruit and vegetables you can afford. Keep a small nail brush in the kitchen so that when you buy non-organic fruit and vegetables you can wash and scrub them to remove any lurking pesticides or bacteria. There has been a rise in the cases of E Coli. It has been suggested that this might have come from unwashed fruit and vegetables. You have enough to deal with so please wash all fruit and vegetables before you use them. 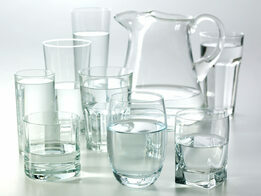 You will see regularly throughout this website about the need to drink water. However, there are many people who can't, simply, because they do not like the taste. 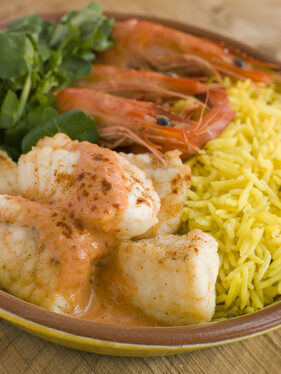 Why not add a slice of lemon, lime, cucumber or mint to give it that extra twist. Please remember, low sugar and sugar free drinks can damage your teeth. Coffee and high caffeine drinks can exacerbate your Lymphoedema by increasing the swelling. With coffee, try switching to decaf. Do you get fed up of drinking water on its own? Why not add a twist? One of the first signs of dehydration is feeling thirsty. There are signs to look for when you might become dehydrated. Those of us that have lymphoedema should drink lots of water, you might be tempted to think the opposite. 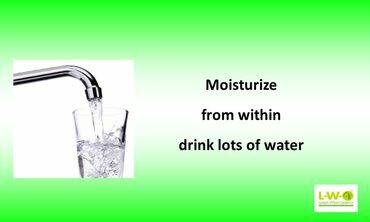 Drinking more water is important because lymph fluid has high protein content. To remove the protein from your tissues, it needs water. Drinking water means that "protein-traffic" moves better around the lymph system. De-Stress - if you are stressed all your problems seem worse. Drinking water provides more energy, eases tension. Lose Weight - healthier than sugary drinks, helps your body work more efficiently. Helps digestion and muscle function. Keeps you looking young - acts as a natural moisturizer, prevents skin drying out this is important because all of us who have lymphoedema have to look after our skin. 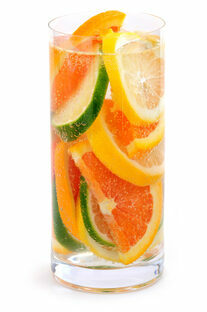 Boosts mood and Brain Power - even somebody who is mildly dehydrated can experience anger, confusion and depression. Sometimes when we think we are hungry it is not always the case. Health professionals have different ideas on what constitutes drinking too much. Someone I know, was asked how much they drink? The answer 3 or 4 pints once a week. A consultant said he thought that was reasonable, but someone else in the same group stated because it was all in one go, that was binge drinking. Conflicting? A 750ml bottle of red, white or rosé wine (ABV 13.5%) contains 10 units. The reason that all this is important to lymphoedema, is that, alcohol does increase swelling. I have given you the guidelines and trust you with your own management. Please make sure you drink plenty of water. One last word, when drinking at home we rarely drink the advised measurements so be aware. Many of L-W-O members love to juice, often starting off their day with fresh fruit or vegetables for breakfast, quick fast healthy breakfast you might think. Only juice the fruit or vegetables you would normally eat and please do not use this for diet alone. With juicing you often remove the skin and therefore remove the fibre. When juicing fibre breaks down and is separated from the juice and left in any slush in the bottom of the juicer. Juicing raises blood sugar levels. Some vegetables can cause a hormone imbalance with someone who has been diagnosed with hypothyroidism. Make sure you wash your fruit and vegetables as there may be either pesticide or bacteria lurking. I couldn't find a decent article or research on juicing, you either love it or hate it. For me personally the hassle of washing the juicer out every time I found a chore, now I simply would rather eat the fruit and veg whole. At the end of the day this is your personal choice. 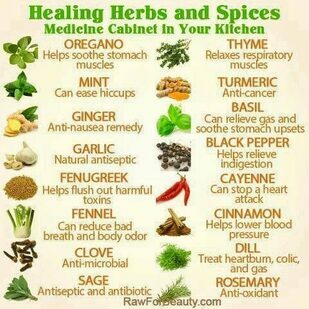 With this in mind there is absolutely no reason why herbs and spices can't be used to flavour food. Why not try growing you own herbs, even if you live in a flat/apartment they grow well on a windowsill. I am not going to go in depth as to why you shouldn't have too much salt because it is simple. The more salt you consume, the more fluid you will retain. 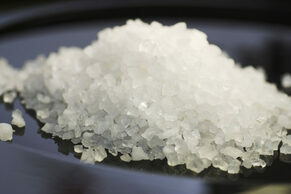 A high sodium diet will cause water retention in your body. This can worsen your lymphoedema. Not always easy in the UK but when you can eat outside. Get that much needed vitamin D from the sun. Just make sure you don't get sunburnt. If there are insects around light a citronella candle to keep them away. Invite friends around, make it a social occasion. We all know of the health risks associated with smoking. However, your circulation is affected by smoking and you do need to look after your skin as it will have been damaged by your lymphoedema. All the research for this Healthy Living page was taken from NHS websites on Lymphoedema, Live Well Eat Well, Alcohol Units and the British Heart Foundation, links will take your directly to those websites. As always interpretations are mine. Take a look at the blog I wrote for Nutrition & Hydration week with reminisces from my childhood.